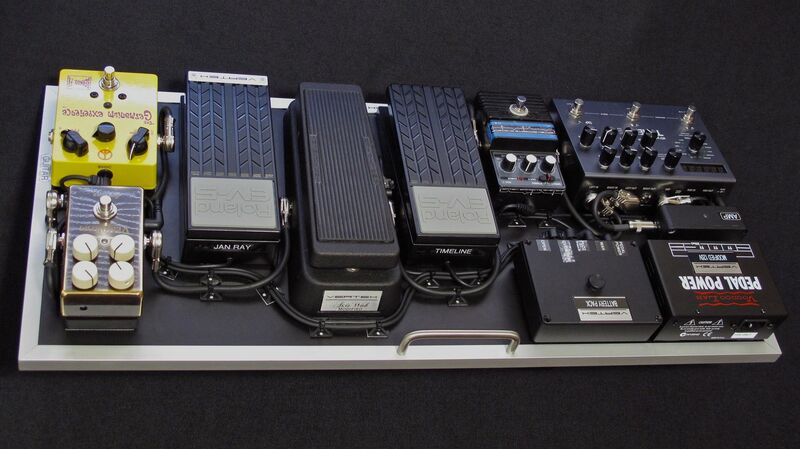 Here's a new pedalboard that I build for Michael Landau. Michael had several requests for this rig that deviate from what many have associated with him in the past. 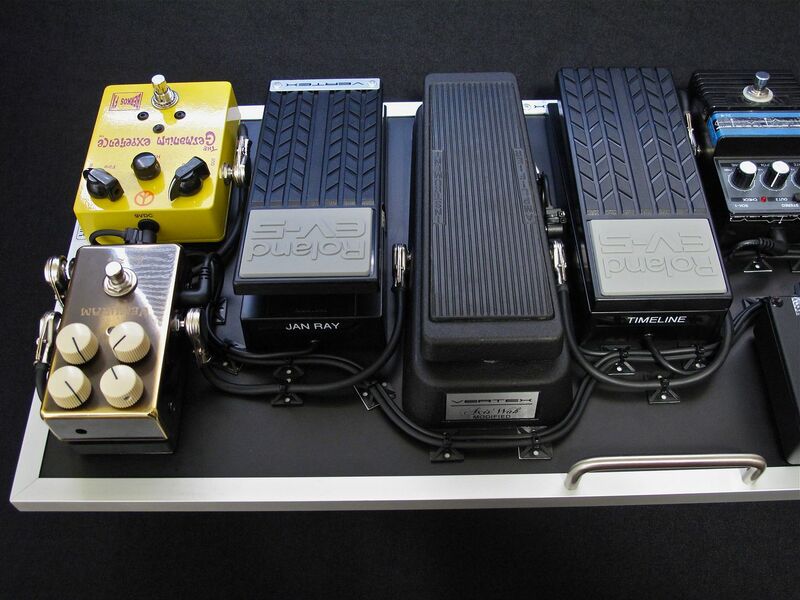 These changes will unfold more as I detail this particular pedalboard below and perhaps in other future projects. 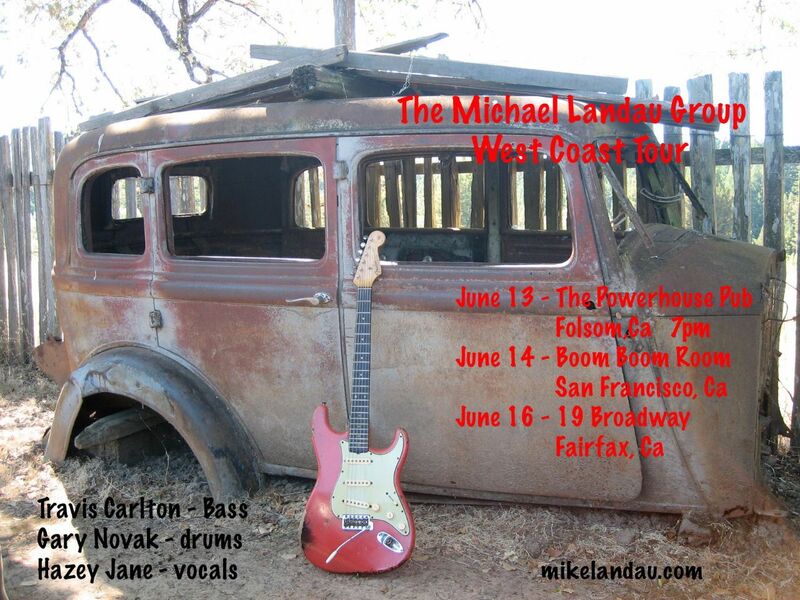 Michael has always been a huge proponent of using batteries for overdrive/distortion pedals and Wah. However, overtime he has found it to be an inconvenience to continue to unplug the inputs of each pedal after sound check and between sets. What I came up with is a customized battery pack that can take four 9V batteries and have individual outputs for each battery just like a traditional power supply (i.e. Voodoo Lab Pedal Power). 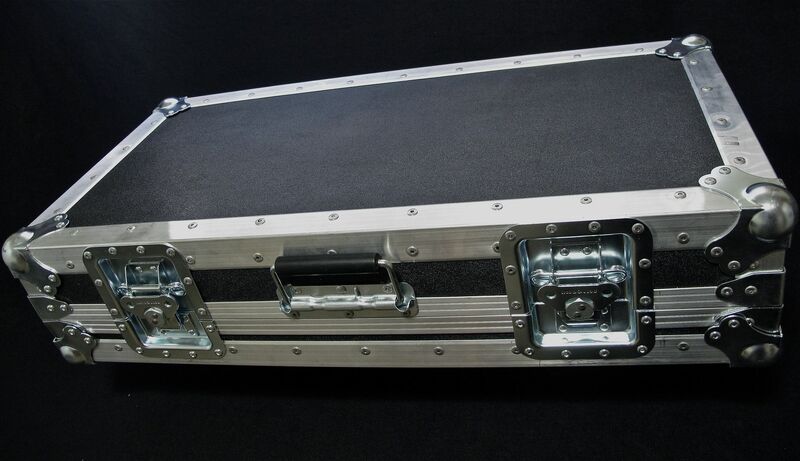 Additionally, I wanted to build in a couple of safeguards to prevent the batteries from running out during a gig or running the batteries down as a result of all of the input jacks being plugged in all the time. 1) Added an additional 9V input jack on the left side of the battery pack (labeled Pedal Power), where the Pedal Power feeds one of its 9V outputs into the battery pack. The 9V from the Voodoo Lab powers a relay inside the battery pack, which will switch over any or all of the 4 batteries in the battery pack if they die or loose power. 2) The same 9V output from the Voodoo Lab (that goes into the battery pack) also powers a second relay that turns off all of the batteries when the AC is disconnected from the pedalboard (on the rear of the Voodoo Lab Pedal Power ISO-5). 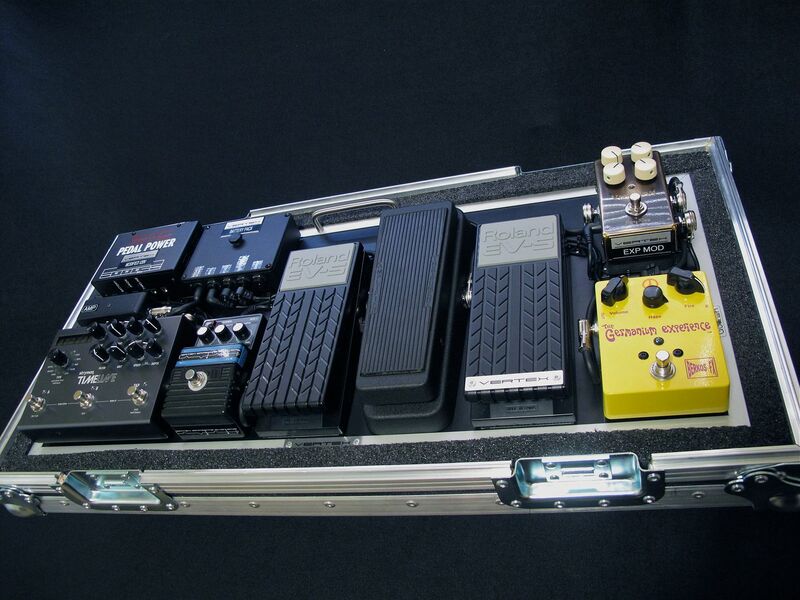 In other words, if the pedalboard isn't powered on, the batteries are all disconnected. Lastly, I added a stand-off in the middle of the battery pack so that the top lid could be removed with a single thumb screw for fast battery changes. Michael and I experimented with different ways to integrate power supplies into the rig to maintain the same tone he was used to on battery. 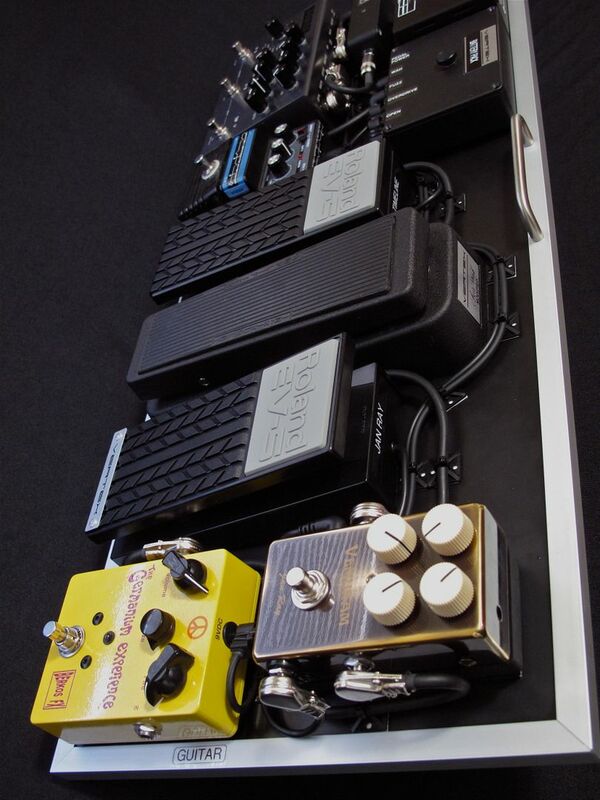 One thing he found was that by limiting the current on each output of the Pedal Power ISO-5 (to only give the pedal receiving the power the exact current and voltage that it needed), it seemed to improve the sound. For example, the Vertex Landau Chorus only needs 9.0VDC and 12mA to operate, so I modified the output going to that pedal to match those specifications. The power output going to the Timeline was unchanged, however the output going to the battery pack needed the unused outputs on the ISO-5 to be paralleled to power the relays inside of the battery pack. I also brought the 18V output on the ISO-5 down to 9V internally to do this. 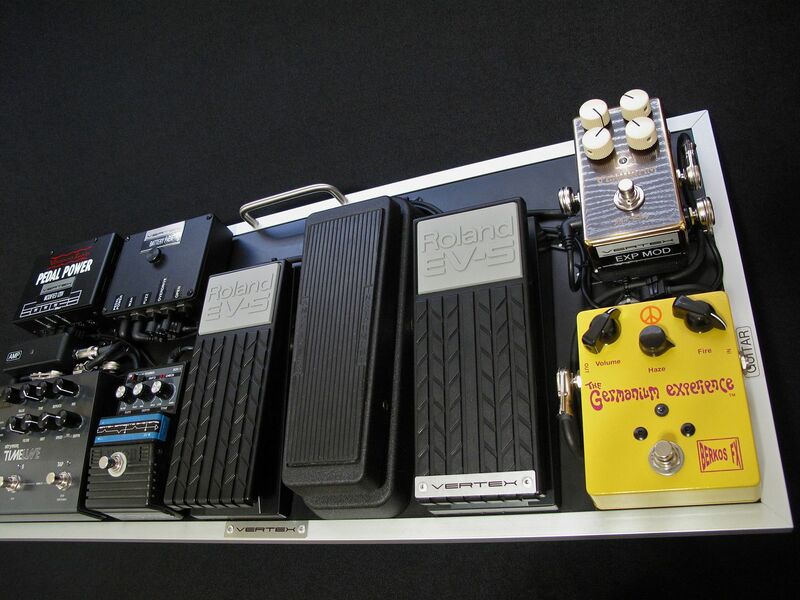 Lastly, I replicated this same modification on a 230V version of the Pedal Power ISO-5 for Michael to use in Europe. Michael called me one day because he was concerned about how his volume pedal was effecting the tone of his original pedalboard. Even though my modifications help, it doesn't undo all of the loss. Mike had been experimenting with using the volume knobs on his pedals to attenuate the level of the signal going through his rig and comparing it with how a volume pedal attenuated the level. He found that when using the volume knob on the pedals to attenuate the volume, it sounded much fatter and 3D compared to the volume pedal. Furthermore, he didn't experience the loss a volume pedal would normally create. He asked if there was any way to control the volume knobs on his pedals by using something he could manipulate with his foot, preferably the size of a Roland EV-5. The next day I started working with the Vemuram Jan Ray Boost (one of Michale's pedals that he wanted to try this modification with) to see if I could design an auxiliary expression jack that could be used to control volume on the Jan Ray Boost with an EV-5. After several hours of experimenting, I was able to match the taper and range of the volume pot in the Jan Ray Boost with using the EV-5 as an expression pedal to control volume. 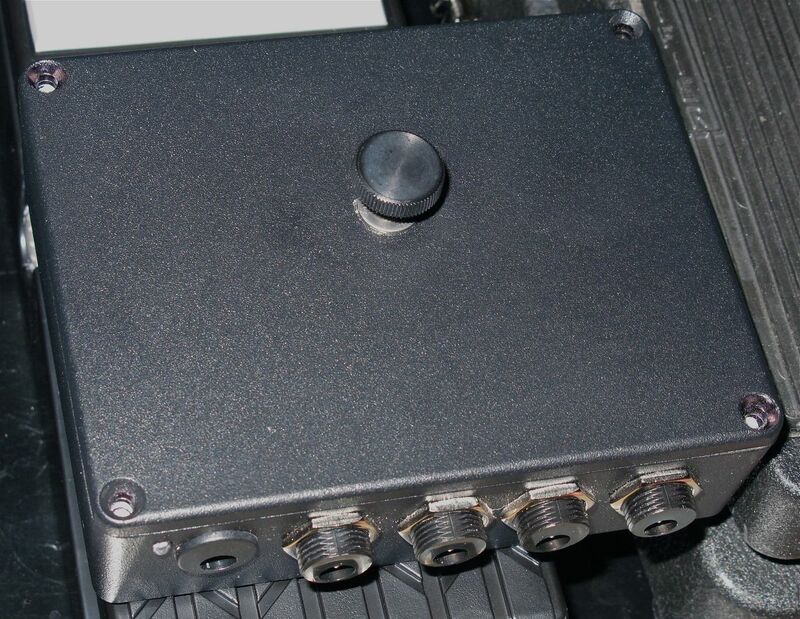 When the expression pedal is disconnected, the volume pot behaves as it normally would without the modification. However, when the expression pedal is plugged in, it bypasses the volume pot on the pedal, and switches over to the EV-5. With the toe forward, the pedal would have full volume, with the heel down the volume would be completely off (silent) and everything in between. This expression modification to the Jan Ray Boost allows Michael to replace the volume pedal completely because he always has this pedal (Jan Ray) on, and it is after all of his other OD/Distortion/Fuzz pedals. The result is, when he attenuates the volume of the Jan Ray, it brings the level down of everything before it as well, just like a volume pedal would, but without any of the sonic deterioration. Ultimately, Michael wants this expression modification to become part of a signature overdrive/boost pedal that I'll design with him. There will be more information to come as this project develops. 3) *Re-house Vertex BC109 Fuzz to match size and orientation of the Berkos Fuzz. * Both the Dallas Arbiter Fuzz and Vertex BC109 will be used interchangeably with the Berkos depending on the sound. The Berkos is the the thickest and dirties and cleans up the least. The Dallas Arbiter cleans up better than the Berkos, but not as much as the Vertex and doesn't have a lot of gain available. The Vertex cuts the best of them all, has the most gain, and is brighter than the Berkos, but darker than the Fuzz Face. 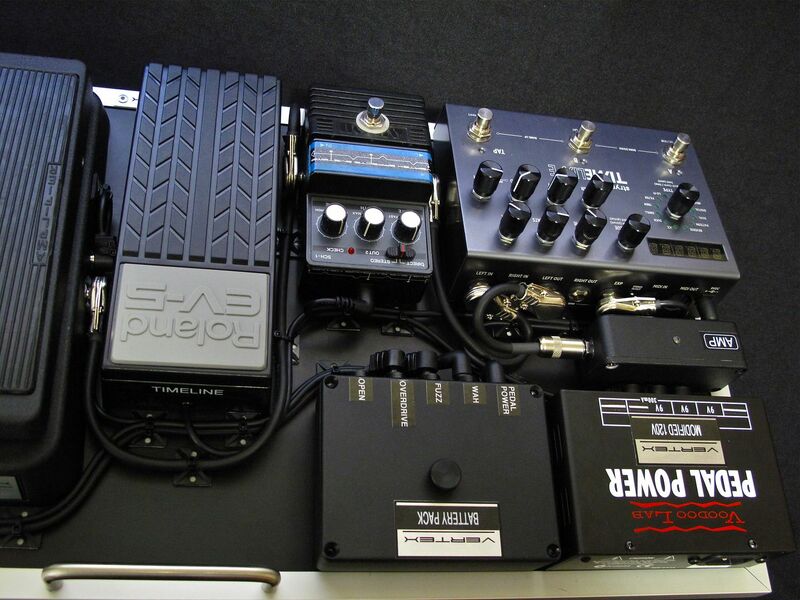 On the pedalboard I used Belden 9778, however Michael requested that I used the Vertex prototype cable that both he and Robben Ford have been using as their primary instrument cables, but I discouraged him. 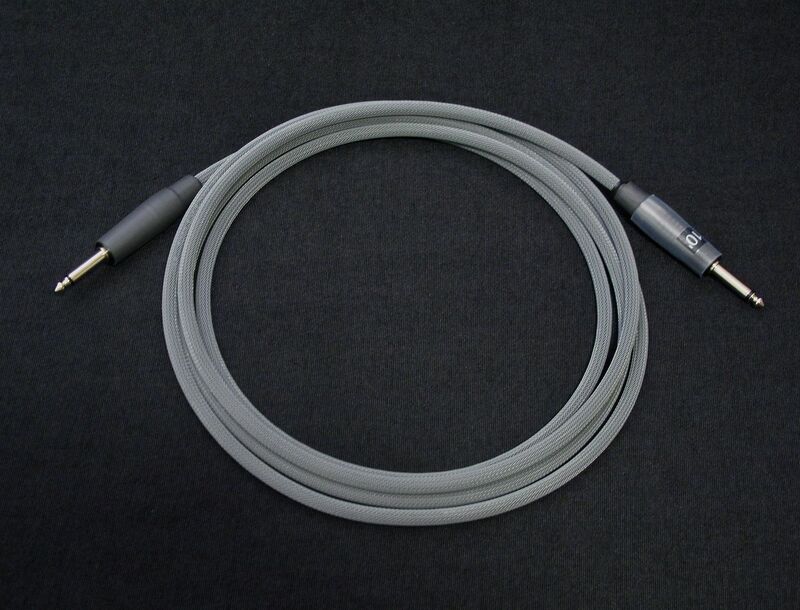 At the moment the diameter of the Vertex cable is too thick to effectively use on a pedalboard, however in the future I plan to design a smaller version.